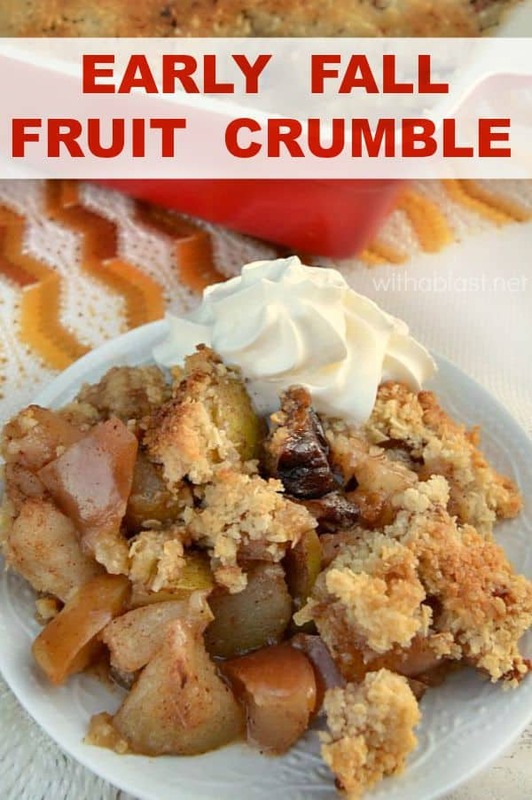 Although my daughter does not like warm fruit, the rest of us love this early Fall Fruit Crumble, or just about any crumble with fruit. Because she is not a fan of desserts with warm fruit, I usually make this during the week as she is only home over weekends. 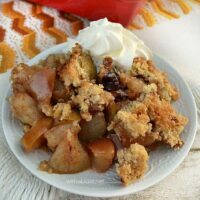 Fortunately, this Fruit Crumble does not take a lot of time to prepare, and is therefore perfect to serve during the week. Only the chopping up of the fruit takes a little time, and by using large fruits, apples and pears, even the chopping goes quicker. We enjoy this dessert with ice-cream or whipped cream and I also served it with a thinnish custard once. However my family (as do I !) much more prefer whipped cream, or ice-cream. The choice is yours. The Almonds together with the Cinnamon not only makes your kitchen smells amazing, but the taste is pure heaven and works so good with the Apples and Pears. Serve warm with whipped cream, ice-cream or custard. Love the crumble – nothing says "autumn" quite like it – and as you say the way it makes your house smell is just too good! Love the idea of mixed fruit! This totally does sound like a great Fall dish!